As the lights go on all over our cities for the festive season, we start to think about decking the halls with holly, hanging mistletoe over the doorway and dressing a pine tree with sparkling baubles to celebrate Yuletide. Many of us like to think we are at least partly following in the Winter Solstice traditions of our ancient pagan ancestors in the evergreens we bring into the home, but a new book by Janis Fry suggests we might have got the wrong trees. In The God Tree, Janis suggests that many of the famous trees from mythology, including the Norse Yggdrasil, the Tree of Life in the Mesopotamian Epic of Gilgamesh and even the tree in the Garden of Eden, weren’t ash, cedar or apple, but yew trees. Druids, rather than worshipping in groves of oak trees, may have considered groves of yews to be most sacred, and the evergreens brought into the house at Yule might have been yew branches rather than firs. Janis even offers evidence that the famed Golden Bough wasn’t mistletoe, as stated in Sir James Frazer’s classic tome, but actually a rare occurrence of a golden branch that grows on yews. Publisher Capall Bann says on its website: "The God Tree is the first book to take up the quest for the Golden Bough since JG Frazer’s classic study in 1915 with the discovery of the bough growing once more, as the rare adornment of a small number of ancient yews. 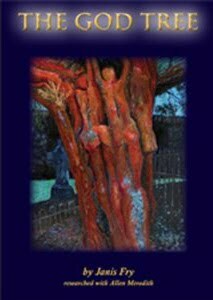 It reveals the fact that yews of particular significance were brought to Britain from Ancient Egypt and the Holy Lands as dry staffs carried by pilgrims, at great personal risk, thousands of years ago. These were planted in remote sanctuaries, particularly in Wales, where they sprouted and grew into trees. Thus those who carried them ensured the continued existence of something so precious, it was essential it be preserved for future generations." Janis points out that yews fit the bill for sacred trees in cultures all over the world, including Britain, not only because of the descriptions given in ancient writings, which she has researched carefully, but also because of the properties of the trees themselves. They are extremely long-lived trees. Even after they have died, branches of the wood if planted in the ground can take root, essentially reincarnating the original tree. Of course yew trees have long been known to have symbolic associations with death. They frequently grow in churchyards and pre-Christian burial sites. Because of this, and because the trees are poisonous, in recent centuries people have often considered yews to be unlucky. Janis points out that although pretty much all parts of the yew tree are toxic, the flesh of the berries has healing properties and a carefully-made preparation of the sap can be used shamanically to give a hallucinatory near-death experience. (Don’t try this at home, kids, as you’ll probably end up really dead). She goes on to recount several tales of miraculous cures people have experienced while meditating under yew trees – sometimes even being brought back from the brink of death after being told by doctors that they had terminal conditions. This leads the author to claim that the Holy Grail, rather than being a chalice or even the bloodline of Christ, might in fact be the wood and juice of the yew tree. So, next time you see a yew tree, it might be worthwhile paying it respects as the true God of the Trees. Having read Janis Fry`s `God Tree`, many, many times, it became a personal `quest`, to try to find some of these trees in the UK, (those found I have notified Janis of), and the elusive `Golden Bough` to be witnessed, and recorded on camera and location. Having visited many of the sites mentioned in Janis`s book, i found one such tree at Glastonbury, close to the well (but not the Chalice Well n gardens), which has led to many other questions and new directions for investigation for the future. I also managed to acquire a tiny slip of the `Golden Bough` with a heel remaining, that was brought on as a cutting, and now is a small tree in its own right, though still in a 10 inch pot. I intend to find a location if possible, that this tiny `God Tree` can be planted, where it will never be disturbed, to perpetuate the legend for future times.